Of all their reprehensible practices, GameStop's trade-in process may be the worst. 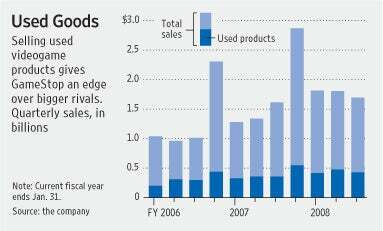 Pity, then, that so few of you are avoiding it, as sales of pre-owned gear in 2008 were up, up, up. The company's sales as a whole were up 22%. If you think that was driven by sales of new games over the holidays, you're wrong. Those were "only" up 19%. No, the big movers were used games and consoles, which in the nine weeks of the holiday season were up 32%, bringing in $543.5 million compared to the $1.9 billion new games raked in. Yet that's still an important figure. A vitally important one, even, because the profit margin GameStop makes on new games is between 7-20%. So they don't get to keep much of the money. But on used stuff? It's an average of 48%, which is as good as cash in the hand. That margin is big enough to make used games comprise an amazing 42% of GameStop's profits.